Sailing with an authentic old gaffer is the best way to discover the charms of traditional sailing. Come and discover the Atlantic coast and its islands, our maritime heritage. Join the classic boat meetings, learn how to sail the old way. Historic 73 foot 1906 schooner. The 1812 Privateer Lynx schooner offers a variety of educational and corporate sailing opportunities. See the ship, our programs, a schedule, several links, references, and more. Based in Cannes, the Folly Too offers daysailing trips to the Lerins Islands. Lulworth was launched at the White Brothers Shipyard in Southampton, in 1920, with the name of Terpsichore (the Greek muse of dancing) where she was built for her first Owner, Mr. R. H. Lee, designed by Herbert W. White and registered on the Lloyd’s Register of Yachts with a displacement of one hundred-eighty-nine tons. Marilee is one of the famous Herreshoff New York Yacht Club 40's known as the "Fighting Forties." Casper Whitney, in the August 1901 issue of Outing magazine referred to the New York Yacht Club 40's as having "that Herreshoff characteristic of passing unperturbed through agitated waters." Edwin J. Schoettle described the New York 40's as "excellent, heavy-weather boats, having an ability to withstand all kinds of rough handling, both by men and weather." Mr. Schoettle further commented, "I have been told that a 40 has never been seen reefed." The new Ranger was born from the owner's enthusiasm for these great yachts. There are new yachts, and older, but none so sleek, fast and with beautiful lines and handling. Bayshore Discovery Project (formerly the Delaware Bay Schooner Project) The A. J. Meerwald is a Delaware Bay oyster schooner, a distinct vessel that evolved to meet the needs of the local oyster fishery. Launched in 1928, the A. J. Meerwald was one of hundreds of schooners built along South Jersey's Delaware Bayshore before the decline of the shipbuilding industry that coincided with the Great Depression. 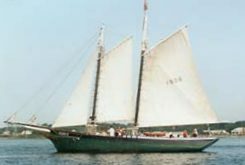 The schooner Adventure was designed by Thomas J. McManus and built in 1926, in Essex, Massachusetts, by the John F. James and Son Shipyard. Sound Experience is non-profit organization which provides hands-on environmental education and leadership experiences for youth and adults. On exciting voyages aboard the historic schooner Adventuress, participants learn about the majesty and vulnerability of our regions definitive resource, Puget Sound. Join the Alliance and step back into history aboard this 105 foot gaff-rigged schooner, sailing the waters of Yorktown, Virginia in summer and Saint Thomas, Virgin Islands in winter. Join us aboard the the only Main Topsail Schooner sailing the world's oceans today that has a full participation crew and is currently sailing in the South Pacific. Join the 139-foot yacht America as she embarks on a North American voyage as the official ambassador of The America’s Cup. America is a replica of the vessel that started the America’s Cup tradition 1851 by defeating the best the British could offer to win the Royal Yacht Squadron’s “100 Pound Cup”. The graceful three-masted schooner American Pride was built in 1941... The once successful fishing schooner now majestically sails the waters of Southern California. Her huge tan-bark colored sails are very visible as she gracefully shares the adventure and the romance of a "tallship" with all who come aboard. Discovering Amistad is a nonprofit educational organization that provides full-year programming on its tall ship, the Amistad, in classrooms and at historic sites of partner organizations. Join us Down East for exciting sailing and exploring, fantastic food, Maine islands and sunsets, and relaxation with new friends aboard Angelique! The Bluenose II Preservation Trust is a volunteer organization established to preserve and operate the schooner Bluenose II for the people of Nova Scotia. The purpose of the trust is to preserve the schooner and ensure that the legacies of traditional seamanship skills and the craft of building great wooden ships are maintained for future generations of Nova Scotians. Looking for the perfect, outdoor, family friendly activity? 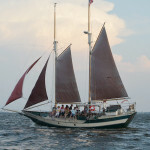 Join the Downeast Rover, for sailing on the OBX.